No. But that doesn’t mean I can’t consider the idea. I borrowed the illustration above from one of my prior posts in response to a mental exercise proposed by Singularity in his post here. I think I have an unfair advantage with an exercise like this. I have a more narrow range of use than many. I don’t race, go on long epic hard rides, do cross country tours, or do any technical off-road riding. I don’t even commute on my bike. I live in a rural area with no big climbs. My riding environment is gently rolling terrain, paved and unpaved country roads, and very little traffic. My needs and wants are basically limited to rambles across the countryside. The variation can be summarized with three categories, (1) short, spirited rides with virtually no load, primarily on paved roads, (2) my typical half-day outings with food, coffee, camera, and clothing layers on paved and gravel roads, and (3) overnight camping, including exploring a few non-technical off-road trails. 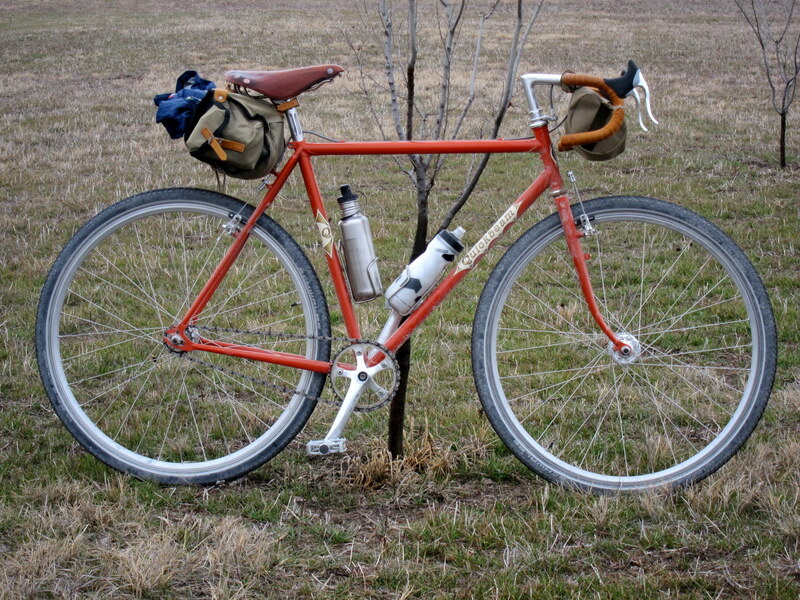 My frameset of choice is the Rivendell Quickbeam. The photo below illustrates my typical (category 2) build. This is the baseline, and my other categories could be satisfied with only a few simple variations. Having three wheelsets is the key to my plan. In addition to the wheels shown above with Schwalbe Marathon Dureme 38mm tires and a 17t fixed cog, I’d propose two other sets of wheels. For spirited riding, something like Grand Bois Cypres 32mm tires and a 15t/16t flip-flop fixed option would satisfy any desire I might have for more speed. For camping and off-road exploration, some kind of knobbly 40mm CX tire and a 18t fixed cog would be fine. If conditions get too rough, I’ll walk. The only other details needed to cover my needs would be racks and bags. I have a Nitto Front rack that I could mount up front and a Nitto Big Rear Rack for the back. I also already have assorted panniers, saddlebags, and handlebar bags to easily mount/remove to meet any load carrying needs. I’m confident that a Quickbeam and a quiver of wheels could pretty much cover my bicycle excursion needs. From spirited riding with a lightish bike, to camping and trail rides, I’d be covered. As shown in the photo above, I’m already set-up for most of what I do on a bicycle. There is one nagging problem with my plan. It doesn’t include a back-up bike. Although that doesn’t apply to this exercise, I need a good back-up bike. Serving that role will be my recently replaced (and soon to be built) A. Homer Hilsen…which basically could be built up with gears to do any of the things I mentioned above. I might one day get to only one. For now, however, I’ve convinced myself I can at least go down to only two. So my other three bikes (MAP, Kogswell P/R, and Trek 660) are officially all for sale. I like your particular quiver of wheels. 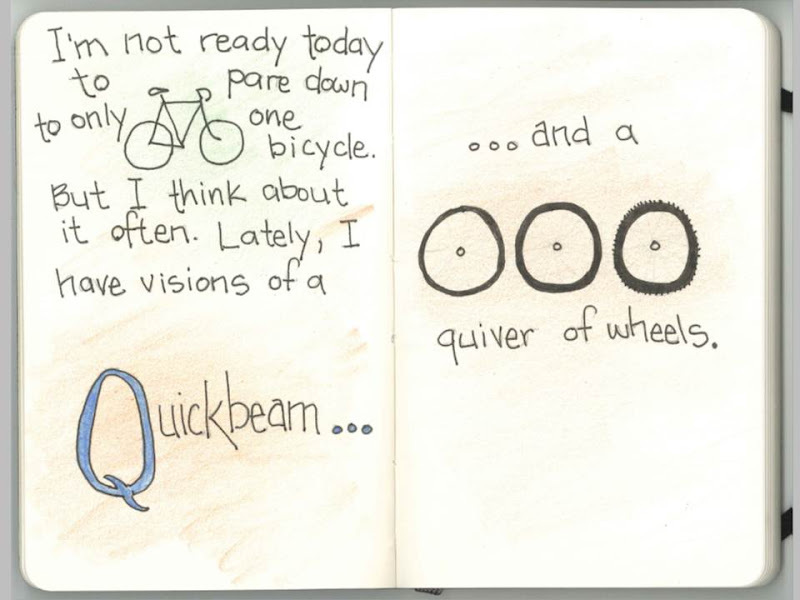 Just for giggles, if I had a Quickbeam, one rear wheel would have a multi-speed internally geared hub of some sort. That would be my camping wheel. The Hilsen would be my one bike. But I’ve always wanted a P/R. You’re not helping with my downsizing efforts. I really like the IGH idea, especially for this exercise. In keeping with my “fixed” theme, maybe the SA fixed 3-speed. My Kogswell P/R is currently built as a fixed gear, but also has dyno hub and Edelux headlight. This 56 would probably make a nice commuter for someone. You’ve discovered an intriguing idea – how tires change the personality of a bike. It’s a brilliant solution! I’ve played around a bit with different tires and wheelsets on my bikes. I haven’t yet thought of paring my bike collection down to only two, and I don’t think I could. At least not right now. I like the simplicity for which you are striving. It seems to me the there are two reasons to have two bicycles; a back-up and a primary. The first would be if the primary bicycle (in this case, your Quickbeam) were to have mechanical issues and become unrideable. Perish the thought! The second would be if the rider was, for some reason, unable to efficiently utilize the primary bicycle i.e. not suitable for the task at hand. Using your various scenarios, the only issue I could see would be carrying much of a load for your overnight camping trips. However, you did mention you could hike-a-bike if it became necessary. I recall while reading Grant Peterson’s description of the SimpleOne, he described riding then walking, when necessary, as a “duathalon” of sorts. Anyway, I find myself wanting to explore various types/styles of bicycles and not yet ready to narrow it down to what I know will work for me. I know I’m several miles behind you in that regard and I applaud you for the goals you’ve set. Lest I missed something, when did the AHH replacement take place? And as to numbers, given your needs and wants, I’d say you’re good to go. I have a few more needs (trails, city commute, increasing touring), but I’m not too sure I need different bikes for such things. And if this AHH hasn’t been appropriately vetted, please do. No official announcement on the new AHH yet. Just the passing reference in this post and a photo of the partial build in my Flickr photo stream. The last of the parts I need are due for delivery tomorrow. I’ll have a more proper introduction soon. I very much like where this is going — and it’s a fine example of the tool suited to the job at hand. Also, the Quickbeam is very much what I had in mind when I specified my custom, monster-cross-like frame for this exercise (I have have selected it outright, if it were still in production). And thanks for contributing to the exercise. It’s producing some interesting setups, and I’m getting some great ideas — either about refining my own setup — or about refining my wants and needs. I’d rather store three wheels than two bikes. And I’d always have that guilt for the bike stuck back at home. Nobody needs that kind of guilt.